Set up a large grid approximately 60 X 40 yards with a goal on each end lines with a keeper. Instruct the players to shout "ONE" if they are the defender closest to the player with the ball. 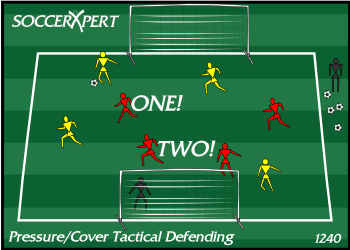 The 2nd defender who is covering the space behind the first defender shouts "TWO" indicating they are the 2nd defender in cover position. If a player fails to shout the appropriate number, the opposing team receives a free-kick. Help the players recognize when they are the 1st or 2nd defenders.